The monarchy of Australia is a form of government in which a hereditary monarch is the sovereign. Australia is a constitutional monarchy, largely modelled on the Westminster system of parliamentary government, while incorporating features unique to the Constitution of Australia. 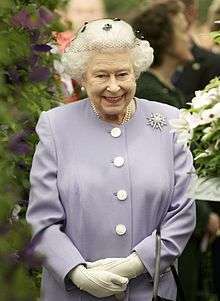 The present monarch is Elizabeth II, styled Queen of Australia, who has reigned since 6 February 1952. She is represented in Australia by the governor-general, in accordance with the Australian constitution and letters patent from the Queen. In each of the states, the monarch is represented by a governor, appointed directly by the Queen on the advice of each of her respective state governments. The Australian monarch, besides reigning in Australia, separately serves as monarch for each of 15 other Commonwealth countries known as Commonwealth realms. This developed from the former colonial relationship of these countries to Britain, but they are now independent of each other and are legally distinct. The monarch of Australia is the same person as the monarch of the 15 other Commonwealth realms within the 53-member Commonwealth of Nations; however, each country is sovereign and independent of the others. On all matters of the Australian Commonwealth, the monarch is advised by Australian federal Ministers of the Crown and, effective with the Australia Act 1986, no British government can advise the monarch on any matters pertinent to Australia. Likewise, on all matters relating to any Australian state, the monarch is advised by the ministers of the Crown of that state. The British government is thus considered a foreign power in regard to Australia's domestic and foreign affairs. Still, the High Court of Australia found that those natural-born citizens of other Commonwealth realms who migrated to Australia could not be classified as aliens (as referred to in the constitution) within Australia, given that they owed allegiance to the same monarch and thus are subjects of the Queen of Australia. However, in Sue v Hill, the High Court of Australia found that the United Kingdom was a foreign power for the purposes of Section 44 of the Australian Constitution, which determines eligibility for parliamentary office. The sovereign's Australian title is currently Elizabeth the Second, by the Grace of God Queen of Australia and Her other Realms and Territories, Head of the Commonwealth. The shared and domestic aspects of the Crown are therein highlighted by way of mentioning the sovereign's role specifically as the Australian monarch separately from, but along with, the his or her other lands. Typically, the monarch is styled King or Queen of Australia and is addressed as such when in Australia or performing duties on behalf of Australia abroad. The sovereign is the only member of the Royal Family to have a title established through Australian law; other members are accorded a courtesy title, which is the title they have been granted via Letters Patent in the United Kingdom. Prior to 1953, the title had simply been the same as that in the United Kingdom. The current form of the title is the result of occasional discussion and an eventual meeting of Commonwealth representatives in London in December 1952, at which Canada's preferred format for the monarch's title was Elizabeth the Second, by the Grace of God, Queen of [Realm] and of Her other realms and territories, Head of the Commonwealth, Defender of the Faith. Australia, however, wished to have the United Kingdom mentioned as well. Thus, the resolution was a title that included the United Kingdom but, for the first time, also separately mentioned Australia and the other Commonwealth realms. The passage of a new Royal Style and Titles Act by the Parliament of Australia put these recommendations into law. Australians do not pay any money to the Queen, either for personal income or to support the royal residences outside Australia. Only when the Queen is in Australia does the Australian government support her in the performance of her duties. This rule applies equally to other members of the Royal Family. Usually the Queen's Australian governments pay only for the costs associated with the governor-general and governors in their exercising of the powers of the Crown on behalf of the Queen, including travel, security, residences, offices and ceremonial occasions. 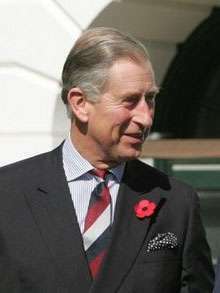 Charles, Prince of Wales, is the heir apparent to succeed the Queen. Succession is according to British laws that have been incorporated into Australian law, both federal and state: namely, the Bill of Rights 1689 and the Act of Settlement 1701. These acts limit the succession to the natural (non-adopted), legitimate descendants of Sophia, Electress of Hanover, and stipulate that the monarch must be in communion with the Church of England upon ascending the throne. By adhering to the Statute of Westminster 1931 in 1942, Australia agreed to change its rules of succession only in agreement with the UK and the other then Dominions. In that spirit, the Perth Agreement of 2011 among the Commonwealth realms committed all of them to amending the line of succession to follow absolute primogeniture for those in the Royal family born in and after 2011. As part of the Agreement, Australia, along with the other realms, repealed the Royal Marriages Act 1772, which gave precedence to male heirs and excluded from succession a person married to a Roman Catholic. In Australia, federal legislation to do this required request and concurrence from all of the states, so that the necessary federal legislation was not passed until 24 March 2015, and took effect on 26 March 2015. Upon a demise of the Crown (the death or abdication of a sovereign), it is customary for the accession of the new monarch to be publicly proclaimed by the governor-general on behalf of the Federal Executive Council, which meets at Government House, Canberra, after the accession. Parallel proclamations are made by the governors in each state. Regardless of any proclamations, the late sovereign's heir immediately and automatically succeeds, without any need for confirmation or further ceremony. 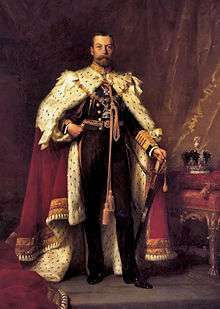 Following an appropriate period of mourning, the monarch is also crowned in the United Kingdom, though this ritual is not necessary for a sovereign to reign; for example, Edward VIII was never crowned, yet was undoubtedly king during his short time on the throne. After an individual ascends the throne, he or she typically continues to reign until death. There is no provision in the law for a monarch to unilaterally abdicate; the only Australian monarch to abdicate, Edward VIII, did so as a consequence of abdicating as monarch of the United Kingdom, with which the Australian government had agreed. The legal personality of a component of the Australian state is sometimes expressed by reference to the sovereign. In criminal prosecutions, the state as a party is ordinarily named as "The Queen"—for instance, "The Queen v Crook". However, the prosecutors themselves are referred to as representing "the Crown". In the same sense, all state lands are called Crown land, state-owned buildings and equipment are called Crown-held property, and the copyright for all government publications is called Crown copyright. Where it is not obvious whether the legal personality concerned is the Commonwealth, one of the Australian States or some other state entity, the reference is specified as "The Queen (or the Crown) in right of" the entity concerned. More commonly and conveniently, however, the entity is referred to directly—for example, as "The Commonwealth" or "The State of New South Wales" or simply "New South Wales". But actions against a government are often brought against the responsible officer ex officio—for example, "Smith v Minister for Town and Country Planning" or, more specifically, "Jones v Director of Public Prosecutions (NSW)". Australia's head of state is the monarch, and its head of government is the prime minister, with powers limited by both law and convention for government to be carried on democratically. The constitution provides that the Queen is part of the Parliament and is empowered to appoint the governor-general as her representative, while the executive power of the Commonwealth which is vested in the Queen is exercisable by the governor-general as her representative. In practice, the Queen does not play a day-to-day role in the government, and the few functions which the Queen does perform (such as appointing the governor-general) are done on advice from the prime minister. The constitution does not directly mention the term "head of state". The constitution defines the governor-general and the state governors as the monarch's representatives. While current official sources use the description "head of state" for the Queen, in the lead up to the republic referendum in 1999, Sir David Smith proposed an alternative explanation, that Australia already had a head of state in the person of the Governor-General, who since 1965 has invariably been an Australian citizen. This view has some support within the group Australians for Constitutional Monarchy. Australia has a written constitution based on the Westminster model of government, with some federal elements modelled on the United States Constitution and a distinct separation of powers. It gives Australia a parliamentary system similar to the other Commonwealth realms, wherein the role of the Queen and governor-general is both legal and practical. The sovereign of Australia is represented in the federal sphere by the governor-general—appointed by the monarch on the advice of the Prime Minister of Australia—and in each state by a governor—appointed by the monarch upon the advice of the relevant state premier. In Australia's constitutional system, one of the main duties of the Governor-General is to appoint a Prime Minister, who thereafter heads the Cabinet and advises the Governor-General on how to execute his or her executive powers over all aspects of government operations and foreign affairs. This means that the monarch's and the viceroy's roles are primarily symbolic and cultural, acting as a symbol of the legal authority under which all governments and agencies operate. 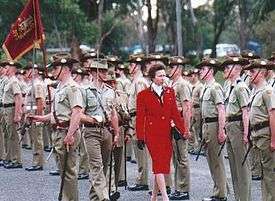 In practice, ministers direct the use of the royal prerogative that resides in the monarch, which includes the privilege to declare war, maintain peace, and direct the actions of the Australian Defence Force. The Governor-General is empowered by the constitution to summon and prorogue parliament, and call elections; however the powers are almost never exercised without advice from the Prime Minister. Still, the royal prerogative belongs to the Crown, and not to any of the ministers and the Governor-General may unilaterally use these powers in exceptional constitutional crisis situations, such as when, during the 1975 Australian constitutional crisis, Sir John Kerr dismissed Prime Minister Gough Whitlam, on the occasion of a stalemate over government funding between the House of Representatives and the Senate. There are also a few duties which must be specifically performed by the Queen. These include signing the appointment papers of Governors-General, the confirmation of the creation of awards of Australian honours, and the approval of any change in her Australian title. In accordance with convention, the governor-general, to maintain the stability of government, must appoint as prime minister the individual most likely to maintain the support of the House of Representatives: usually the leader of the political party with a majority in that house, but also when no party or coalition holds a majority (referred to as a minority government situation), or other scenarios in which the governor-general's judgement about the most suitable candidate for prime minister has to be brought into play. The governor-general also appoints to Cabinet the other ministers of the Crown, who are, in turn, accountable to the Parliament, and through it, to the people. The Queen is informed by her viceroy of the acceptance of the resignation of a prime minister and the swearing-in of a new prime minister and other members of the ministry, and she holds audience with her Australian ministers where possible. Members of various executive agencies and other officials are appointed by the governor-general, including High Court justices. Ministers and parliamentary secretaries are also appointed to the Federal Executive Council. Public inquiries are also commissioned by the Crown through a Royal Warrant, and are called Royal Commissions. A casual vacancy in the Senate is filled by an appointee from the same political party by a state parliament or state governor. The royal prerogative also extends to foreign affairs: the Governor-General-in-Council negotiates and ratifies treaties, alliances, and international agreements. 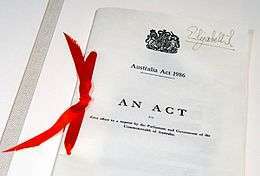 As with other uses of the royal prerogative, no parliamentary approval is required; however, a treaty cannot alter the domestic laws of Australia; an Act of Parliament is necessary in such cases. The governor-general, on behalf of the Queen, also accredits Australian High Commissioners and ambassadors, and receives diplomats from foreign states. In addition, the issuance of passports falls under the royal prerogative, and, as such, all Australian passports are issued in the name of the governor-general as the monarch's representative. All laws in Australia, except in the Australian Capital Territory (ACT) Legislative Assembly, are enacted only with the viceroy's granting of Royal Assent, done by the governor-general or relevant governor, with the Great Seal of Australia or the appropriate state seal, while territorial legislatures, unlike their state counterparts, are subject to the oversight of the government of Australia. The governor-general may reserve a bill "for the Queen's pleasure"; that is withhold his consent to the bill and present it to the sovereign for her personal decision. Under the constitution, the sovereign also has the power to disallow a bill within one year of the Governor-General having granted Royal Assent. This power, however, has never been used. In accordance with the Australia Act 1986, the Queen has the power to appoint, on the advice of the relevant state premier, a governor in each of the Australian states, who themselves appoint executive bodies, as well as people to fill casual Senate vacancies, if the relevant state parliament is not in session, under the Great Seal of the State. The state governors continue to serve as the direct representatives of the Queen, in no way subordinate to the governor-general, and they carry out on her behalf all of the Queen's constitutional and ceremonial duties in respect of their respective state. The Northern Territory and the Australian Capital Territory resemble states in many respects, but are administered directly by the Commonwealth of Australia; an administrator, appointed by the governor-general upon the advice of the Commonwealth government, takes the place of a state governor in the Northern Territory. The Australian Capital Territory has no equivalent position. The monarchy is presently symbolised through images of the sovereign on currency and in portraits in public buildings; on Australian decorations and honours, some postage stamps and on coats of arms and other government symbols. The crown is used as a heraldic symbol in the coats of arms of the Commonwealth and the states of Victoria, Queensland and Western Australia. Crowns are also visible on police and military badges. The Queen's Birthday is observed as a public holiday in all states. Neither the Queen nor the governor-general or any of the state governors have any religious role in Australia. There never has been an established church in Australia, either before or since Federation in 1901. Pursuant to the Australian Constitution the Commonwealth may not enact a law establishing any religion or prohibiting the free exercise of religion. This is one of the key differences from the Queen's role in England where she is the Supreme Governor of the Church of England. The Governor-General's official residence is Government House, commonly known as "Yarralumla", in the city of Canberra. The Australian monarch stays there when visiting the country as do visiting heads of state. Government House is the site of most state banquets, investitures, swearing-in of ministers, and other ceremonies. Another vice-regal residence is Admiralty House, in Sydney, and is used principally as a retreat for the Governor-General. The states of New South Wales, Victoria, Western Australia, Queensland, Tasmania, and South Australia also maintain residences, used by the respective Governors, though the monarch or other members of the Royal Family will stay there when in the state. These residences are the property of the Crown in respect of each relevant federal or state government, and not of the monarch in his or her personal capacity. The development of a distinctly Australian monarchy came about through a complex set of incremental events, beginning in 1770, when Captain James Cook, in the name of, and under instruction from, King George III, claimed the east coast of Australia. Colonies were soon after founded across the continent, all of them ruled by the monarch of the United Kingdom, upon the advice of his or her British ministers, the Secretary of State for the Colonies, in particular. After Queen Victoria's granting of Royal Assent to the Commonwealth of Australia Constitution Act on 9 July 1900, which brought about Federation in 1901, whereupon the six colonies became the states of Australia, the relationship between the state governments and the Crown remained as it was pre-1901: References in the constitution to "the Queen" meant the government of the United Kingdom (in the formation of which Australians had no say) and the Colonial Laws Validity Act 1865 – by which colonial laws deemed repugnant to imperial (British) law in force in the colony were rendered void and inoperative – remained in force in both the federal and state spheres; and all the governors, both of the Commonwealth and the states, remained appointees of the British monarch on the advice of the British Cabinet, a situation that continued even after Australia was recognised as a Dominion of the British Empire in 1907. As Queen-Empress, Victoria "symbolised the British Empire of which all Australians were subjects". In response to calls from some Dominions for a re-evaluation in their status under the Crown after their sacrifice and performance in the First World War, a series of Imperial Conferences was held in London, from 1917 on, which resulted in the Balfour Declaration of 1926, which provided that the United Kingdom and the Dominions were to be considered as "autonomous communities within the British Empire, equal in status, in no way subordinate to one another in any aspect of their domestic or external affairs, though united by a common allegiance to the Crown." The Royal and Parliamentary Titles Act, 1927, an Act of the Westminster Parliament, was the first indication of a shift in the law, before the Imperial Conference of 1930 established that the Australian Cabinet could advise the sovereign directly on the choice of Governor-General, which ensured the independence of the office. 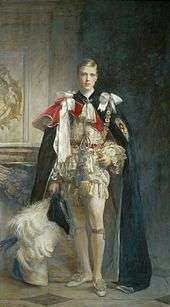 The Crown was further separated amongst its dominions by the Statute of Westminster 1931, and, though it was not adopted by Australia until 1942 (retroactive to 3 September 1939), the law's validity in the United Kingdom required its government to seek Australia's consent in allowing the abdication of Edward VIII as the King of Australia and all the other Dominions in 1936. 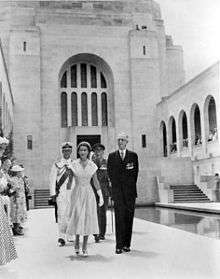 The sovereign did not possess a title unique to Australia until the Australian parliament enacted the Royal Styles and Titles Act in 1953, after the accession of Elizabeth to the throne, and giving her the title of Queen of the United Kingdom, Australia and Her other Realms and Territories. Still, Elizabeth remained both as a queen who reigned in Australia both as Queen of Australia (in the federal jurisdiction) and Queen of the United Kingdom (in each of the states), as a result of the states not wishing to have the Statute of Westminster apply to them, believing that the status quo better protected their sovereign interests against an expansionist federal government, which left the Colonial Laws Validity Act in effect. 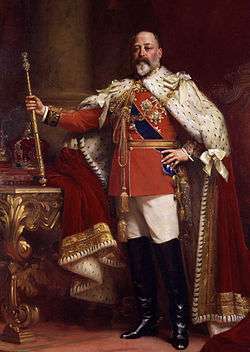 Thus, the British monarch could still – at least in theory, if not with some difficulty in practice – legislate for the Australian states, and the viceroys in the states were appointed by and represented the sovereign of the United Kingdom, not that of Australia; as late as 1976, the British ministry advised the Queen to reject Colin Hannah as the nominee of the Queensland Cabinet for Governor, and court cases from Australian states could be appealled directly to the Judicial Committee of the Privy Council in London, thereby bypassing the Australian High Court. It was with the passage of the Australia Act in 1986, which repealed the Colonial Laws Validity Act and abolished appeals of state cases to London, that the final vestiges of the British monarchy in Australia were removed, leaving a distinct Australian monarchy for the nation. The view in the Republic Advisory Committee's report in 1993 was that if, in 1901, Victoria, as Queen-Empress, symbolised the British Empire of which all Australians were subjects, all of the powers vested in the monarch under Australia's Constitution were now exercised on the advice of the Australian government. In practice, the Queen's representative in Australia, the Governor-General, represented the British Government directly in 1901 and until 1936, when the first High Commissioner of the United Kingdom to Australia was appointed. It was around the same time that a discussion on the matter of Australia becoming a republic began to emerge, later culminating in the 1999 Australian republic referendum, which was defeated by 54.4% of the populace, despite polls showing that the majority supported becoming a republic. It is believed the proposed model of the republic (not having a directly elected president) was unsatisfactory to most Australians. The referendum followed the recommendation of a 1998 Constitutional Convention called to discuss the issue of Australia becoming a republic. Still, nearly another ten years later, Kevin Rudd was appointed as Prime Minister, whereafter he affirmed that a republic was still a part of his party's platform, and stated his belief that the debate on constitutional change should continue. Smith, David (2005). Head of State: the Governor-General, the Monarchy, the Republic and the Dismissal. Paddington, NSW: Macleay Press. ISBN 1876492155. ↑ R v Foreign Secretary; Ex parte Indian Association, QB 892 at 928; as referenced in High Court of Australia: Sue v Hill  HCA 30; 23 June 1999; S179/1998 and B49/1998. Austlii.edu.au. ↑ Buckingham Palace: The Queen and Commonwealth: Australia. Royal.gov.uk (22 August 2012). 1 2 Te and Dang (2002) 193 ALR 37 and Chu Keng Lim v Minister for Immigration, Local Government and Ethnic Affairs (1992) 176 CLR 1 at 54 as referenced in Parliament of Australia: Parliamentary Library: Prince, Peter; Research Paper no. 3 200304: We are Australian–The Constitution and Deportation of Australian-born Children; Law and Bills Digest Group; 24 November 2003 Archived 21 August 2008 at the Wayback Machine. ↑ Twomey, Anne (2000). "Sue v Hill – The Evolution of Australian Independence". In Stone, Adrienne; Williams, George. The High Court at the crossroads: essays in constitutional law. New South Wales, Australia: Federation Press. ISBN 1-86287-371-2. ↑ Documents on Canadian External Relations; Volume No. 18 – 2; Chapter 1, Part 2, Royal Style and Titles Archived 16 September 2004 at the Wayback Machine. ↑ "Documenting a Democracy > Royal Style and Titles Act 1973 (Cth)". Museum of Australian Democracy. Retrieved 3 November 2015. ↑ Constitution s 51(xxxviii); the Northern Territory added its request and concurrence, although this was not constitutionally required. ↑ Succession to the Crown Act 2015 (Cth), ComLaw. ↑ For example, Fortescue Metals Group Limited v The Commonwealth  HCA 34 (7 August 2013); Unions NSW v New South Wales  HCA 58 (18 December 2013). Retrieved 19 January 2014. ↑ The Form and Order of Service that is to be performed and the Ceremonies that are to be observed in the Coronation of Her Majesty Queen Elizabeth II in the Abbey Church of St. Peter, Westminster, on Tuesday, the second day of June 1953. Oremus.org (11 April 1994). ↑ "Oaths and affirmations made by the executive and members of federal parliament since 1901". Parliament of Australia. 3 June 2013. Retrieved 18 September 2013. ↑ Shears, Richard (4 December 2007). "Australia's new PM is sworn in – but refuses to swear allegiance to the Queen". Daily Mail. London: Associated Newspapers Ltd.
↑ Governor General of the Commonwealth of Australia: Transcript – World Today with Major General Jeffery – 23 June 2003 Archived 2 June 2009 at the Wayback Machine. ↑ Governor-General of Australia :: Governor-General's Role. Gg.gov.au. ↑ Australian Government: It's an Honour: Official Creation of Awards. Itsanhonour.gov.au (16 May 2011). ↑ Commonwealth of Australia Gazette; No. S 86, Monday, 30 May 2005 Archived 21 February 2007 at the Wayback Machine. ↑ Office of the Governor-General of Australia. "About the Governor-General: Governor-General's role". Australian Government Publishing Service. Retrieved 16 March 2011. ↑ Australian Constitution section 5 Archived 11 December 2007 at the Wayback Machine. ↑ Australian Constitution s 59 Archived 11 December 2007 at the Wayback Machine. 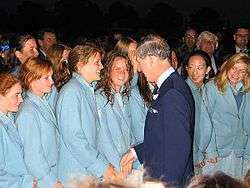 1 2 Gibbs, Harry; ''The Crown and the High Court – Celebrating the 100th birthday of the High Court of Australia''; 17 October 2003. Norepublic.com.au (17 October 2003). ↑ The Queen as Fount of Justice. Royal.gov.uk (17 December 2013). ↑ High Court of Australia: The Queen v Tang HCA 39 (28 August 2008). Austlii.edu.au. ↑ Buckingham Palace: Guidelines and Procedures for the Acceptance, Classification, Retention and Disposal of Gifts to Members of the Royal Family. Royal.gov.uk (22 August 2012). ↑ The Queen's message following the fires in Australia. Royal.gov.uk. 1 2 The Princess Royal to visit areas affected by the Victorian bushfires. Royal.gov.uk. 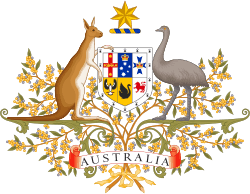 ↑ Australian Constitution s 116 Archived 5 March 2008 at the Wayback Machine. ↑ "Government House". The Australiana Fund. Retrieved 14 April 2008. ↑ Raspal Khosa (2004). Australian Defence Almanac 2004–05. Australian Strategic Policy Institute, Canberra. Page 4. ↑ Prince Philip, Duke of Edinburgh. Mlahanas.de. ↑ Queen and Commonwealth: Australia: History. Royal.gov.uk (22 August 2012). ↑ B. Hunter (ed) The Statesman's Year Book, MacMillan Press, p.102 ff. ↑ Biography – first Duke of Gloucester – Australian Dictionary of Biography. Adbonline.anu.edu.au. ↑ Newspoll polls 1995–2002, The Australian Archived 15 June 2005 at the Wayback Machine. ↑ Paul Keating: republicanism, People and power, Power, people and politics in the post-war period, History Year 9, NSW | Online Education Home Schooling Skwirk Australia. Skwirk.com (1 January 2001). ↑ Kevin Rudd reaffirms support for republic | PerthNow. News.com.au (6 April 2008). ↑ "Republic floats away as royal reign lingers" by Judith Ireland, The Canberra Times, 22 October 2011. ↑ Mansillo, Luke (25 January 2016). "Loyal to the Crown: shifting public opinion towards the monarchy in Australia". Australian Journal of Political Science. Retrieved 2016-01-29.